Players after 50th will be replaced based on priority rule: King > Chancellor > 3 Lords> 6 Officials > Arena Ranking). When less than 50 players registered, soldiers will take place. The battle is divided into 2 matches. The first one chooses 2 nations to battle based on Morale. The nation winning this match will battle with the third nation in the second match. King of the victory nation will become Emperor. Each battle consists of two parts. First is 5 matches of 1v1, then 1 team battle of [50v50], victory will be based on the result of the team battle. Each single challenge gives 2 minutes to prepare. The attacker and the defender send 1 player to challenge. After 2 minutes of preparation, 2 players will battle 1v1. Win gives 50 Impulse for the nation (5% ATK-DEF buff), loss gives 20 Impulse (2% ATK-DEF buff). Higher level lords when registered can replace lower level lords in single challenge. When team battle ends, reward will be sent based on each lord’s battle effort, more wins, better rewards. 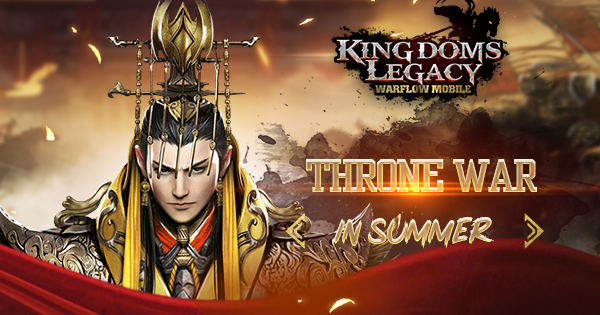 After the emperor ascended, all will be rewarded: victory nation receives 1 Gold Chest, other nations receive 1 Silver Chest. Emperor’s lady can be 3-5 stars. 6 lords’ lady can be 3 - 4 stars.